Use this coupon code at Candy Club today to save $20 off your first month. Act now and get 6 tubs of candy for the price of 3 when you use this Candy Club coupon code at checkout. Act now and save up to 60% off candy favorites in each box from Candy Club. Check out Candy Club online for their latest special offers. 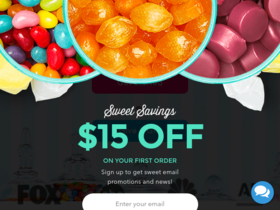 Sign up and get a special $15 discount coupon from Candy Club.